We are synonymous with and born of the earth, so are we made of the same stuff as our houses....We built them, tasted them, talked with them, climbed on them, lived with them, and watched them die.... The entire community was the house. Tsankawi (sank-ah-WEE) was built in the 1400s A.D. by ancient Pueblo Indians sometimes known as the Anasazi. Archeological evidence indicates that the Indians first settled the surrounding area in small communities during the late 1100s. Over time fewer, but larger communities were built. Tsankawi was one of these larger communities. Ancient trails worn into the rock. 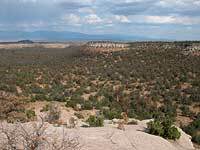 Tsankawi is part of Bandelier National Monument, but is undeveloped and unexcavated. 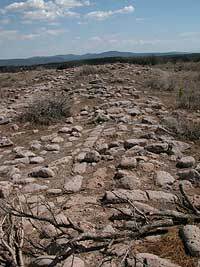 The trail follows centuries-old paths through the area where the ancestral Pueblo people lived. Imagine the people tending their gardens and going about their daily lives surrounded by the expansive vistas of what are now known as the Jemez Mountains, the Sangre de Cristo Mountains, and valleys resulting from the Rio Grand rift. According to Pueblo tradition, the people of Tsankawi spoke Tewa, while those in Frijoles Canyon, the main section of Bandelier, spoke Keres. While their languages were different, their religious beliefs, lifestyles, and worldviews were similar. Even today, active pueblos San Ildefonso, Cochiti, and others retain strong social and traditional ties with these two cultural sites. 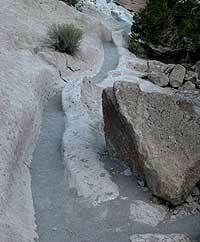 The 1.5 mile trail through Tsankawi takes you along centuries-old paths of the ancestral Pueblo people. In many areas, the trails have been worn into the rock 8 to 24 inches or more as the people traveled from the mesa tops to their farms in the canyons below. The trails also connected to other villages in the surrounding area. The natives either wore sandals or walked barefoot. Looking down one of the sides of the Tsankawi ruins. The central plaza is off to the right. In the Tewa language of nearby Pueblos the name for Tsankawi, saekewikwaje onwikege, means "village between two canyons at the clump of sharp, round cacti." The village ruins are reached after the trial winds through cliffs covered with petroglyphs and climbs to the top of the Mesa. The village was built out of tuff stone plastered inside and out with mud. It was roughly rectangular in shape with about 350 rooms and an enclosed central courtyard or plaza. Not only were the rooms used for cooking and sleeping, but for storage of food for the winter months or when crops failed. The architectural design with rooms surrounding a central plaza is still used by present day Indians. The buildings were two or perhaps three stories high with roofs made out of wood and mud. But why have a village on the top of a mesa where, with the exception of rain collected into a small reservoir, water had to be hauled from the springs or rivers below? Was the mesa top a place of defense? There has not been any archeological evidence of warfare, but further research is needed. Part of a wall of stones used to collect water runoff. The Tsankawi inhabitants were totally dependent upon the environment for survival. Their food, clothing, and shelter came from "Mother Earth". The climate was dry averaging 15 inches of rainfall a year, yet the inhabitants were able to develop an agricultural way of life. They made use of native plants such as the pinion pine, juniper, rabbit brush, saltbush, mountain mahogany, and yucca for food, dyes, medicine, and tools. They also cultivated corn, beans and squash. Yet in this sparse environment, natural resources were scarce, and over time the Puebloans depleted their resources. Firewood became hard to find and the soil became exhausted due to centuries of farming. During the 1500s an extended drought, indicated by tree ring dating, forced the inhabitants to move on. The pueblo at San Ildefonso, 8 miles away, have the tradition that their ancestors lived at Tsankawi and the surrounding area. The people of Tsankawi were not isolated. There were many villages on nearby mesas or in the canyons. The people traded tools, blankets, pottery, feathers, turquoise, seashells, and agricultural products. They joined together for religious activities. The village plaza may have been a gathering place for dancing and ceremonies. Imagine what it must have been like for the inhabitants. The mesa top would have had a flurry of activity. Women were busy cooking, sewing, grinding corn, or making pottery. Men were tending their fields in the valleys below, making tools, or tending to a number of other jobs essential for their survival. There were the sounds of children playing, people singing, dogs and turkeys chasing each other. The smells of cooking, household fires, drying meat, and people in close quarters would fill the air. Since there was no metal, tools were made from local materials. Obsidian formed by the Jemez volcanoes was used to make arrow points, knives, and scrapers. 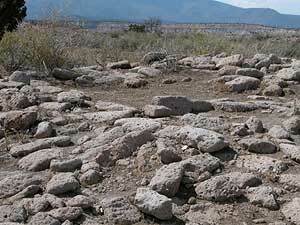 Volcanic basalt was used as manos and metates to grind seeds and corn. It was also used to enlarge the soft tuff caves and to shape blocks used in building. After the inhabitants left in the late 1500s, the buildings fell into ruin. The roofs collapsed and the walls crumbled. Wind blown materials filled the cracks and crevices so that only mounds of rubble can be seen with pieces of pottery lying on the ground. Today the Tsankawi mesa top is quite and peaceful, yet speaks of a people long gone.